The hosts Lin, Em and Sarah picked a great topic for this week because anything to do with TV is my favorite subject. I actually don't have a PVR (or DVR) so once the Fall hits, I plan my life around my TV schedule. There are certain nights that I won't commit to anything social because I have to be home to watch shows live and then there are some shows that I can afford to miss because I know that I can watch them on-demand. These are the shows I can afford to miss because I know that I can catch them again at some point, whether online, on-demand or with time-shifting. I would want to watch Sons of Anarchy live but our FX Canada channel is stupid and is still playing season three. 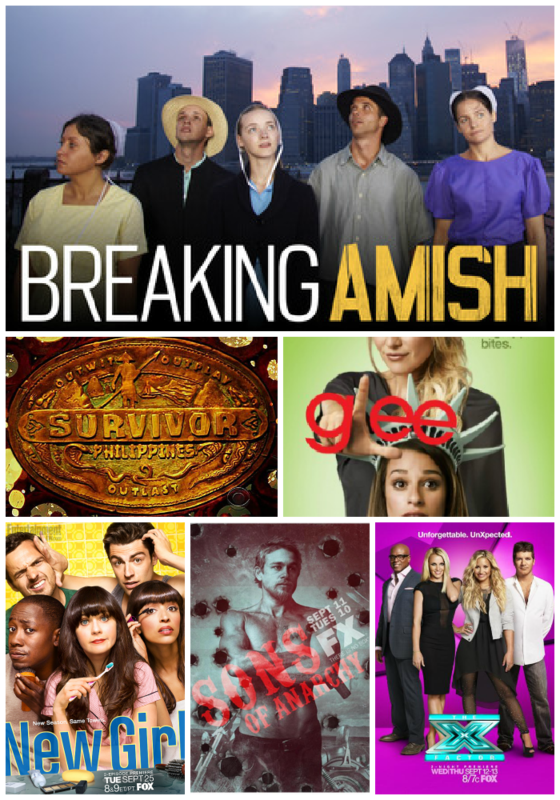 Breaking Amish - I wasn't planning on watching this but last weekend there was nothing to watch so we caught the first episode. We are now hooked. It's so interesting to see the four Amish and one Mennonite explore life outside of their community. It must be an eye-opener to be in NYC and see how the rest of the world lives. Survivor: Philippines - Hard to believe that it's season 25. I have watch almost every season except for maybe three or four. I feel like I should watch because it's being filmed in my homeland (well, not really because I was born in Canada). Glee - I hate how they moved it to Thursday night at 9 pm, it now conflicts with Grey's Anatomy. If it wasn't for Kate Hudson and her awesomeness, I don't know if I would still be watching. But I do love all the singing! New Girl - My one and only half hour sitcom (well, until Cougar Town returns). This show is hilarious and I love the quirkiness of Jess and even Schmidt. They both carry the show. Sons of Anarchy - This was the first show to premiere for the Fall and only two episodes in, I am SERIOUSLY hooked. I hate how I can't watch it live and I am lucky that no one is spoiling on Twitter. I can't wait to see how everything unfolds and if my theories are correct. I really like the new character Nero but I feel like he has something up his sleeve - no one is that nice. X-Factor - Britney and Demi bring a whole new freshness to the table. I didn't watch last season because I can't stand Paula Abdul. I can't wait to see more of Brit, she has certainly made a comeback - watch out Xtina, your rival is back! Now these shows, I must watch live, I don't know why...maybe it's because too many spoilers go around Twitter ruining it for me. I have been a long time fan of these shows and I have invested so much time to them that I need to see each season through. 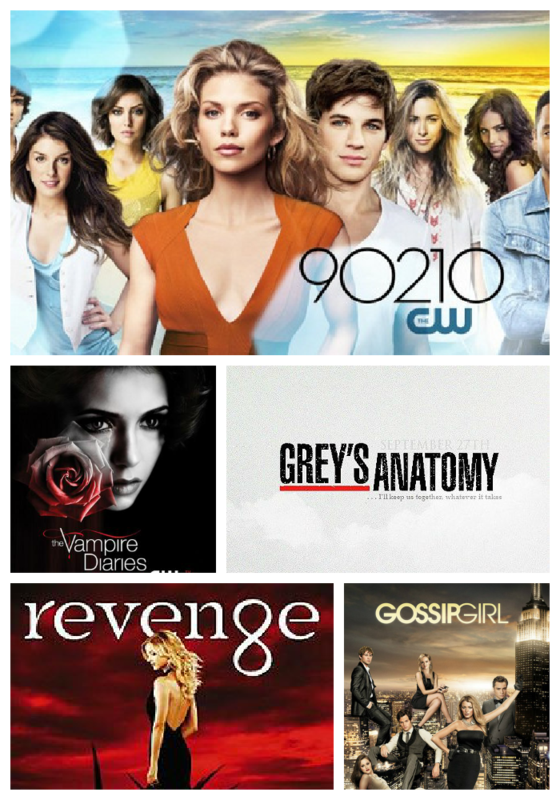 90210 - Not the greatest show but I started from the beginning because of my love for the original Beverly Hills 90120. 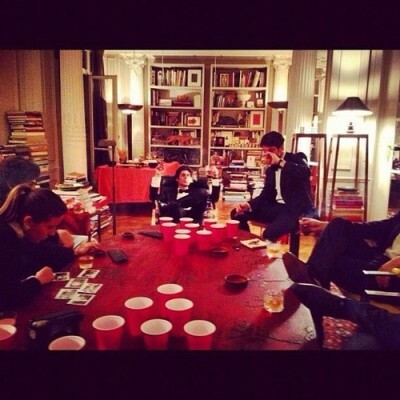 Characters have come and go, and story lines aren't anything new but yet, I still am intrigued by the lives of spoiled rich kids (hence, why I also like Gossip Girl). The Vampire Diaries - The only show where ALL the guys are hot!!! Vampires and werewolves, oh my! Now that our beloved Elena is a vampire (sorry if I spoiled it for you), it's going to be interesting how it pans out. Grey's Anatomy - I was so upset to find out that it was Lexie who would not be returning and would die on the season finale. I'm also upset that Teddy is gone (I think) and Sloan will be next. I know that they are going to bring in new characters, I just hope they aren't as annoying as April. Revenge - My new favorite show. I remember last year, everyone was raving about Revenge but I had no clue what it was about. Then early in the summer when there was nothing to watch, my husband and I finished the entire season in a couple of days. We then told everyone that they need to watch it (good thing Kat and my sister-in-law listened). Gossip Girl - I read all the books and watched all five season (although I didn't watch the last season because I had sewing classes but caught up while on vacation in Mexico), so I need to see it through to the very end. I am glad they are ending it because there have been times when it got boring but I have to say, the end of season five picked up. What Fall shows are you excited for? ...to be obsessed with donuts. My good friend Marie was kinda enough to bring me two donuts from a secret shop - The Godfather and Brown Butter Glaze. They were delicious. I was thrilled to receive the donut charms I ordered, they are adorable. ...to be flipping back and forth about buying a sewing machine. It's a huge purchase and commitment in my eyes. I don't want to buy it, sew for a weekend and then let it collect dust. ...to be mentally packed for our trip to Punta Cana - IN DECEMBER! I want to be on a beach again stat! ...to finally understand why the pool servers at the resort we were staying at in Mexico wanted my Sidewinder Studs so bad - it's because they look like a serpent and in the Mayan culture, Kukulkan was a Maya snake deity. If I had known the significant meaning of the snake to his culture, I would have given it to him and bought a new one when I returned home. I was hesitant because they are my favorite earrings. ...to be lusting over Ian Somerhalder. I read the entire 50 Shade of Grey trilogy picturing him. He has to be Christian Grey if they make a movie. I'm glad Vampire Diaries will be starting next month. ...to not own a PVR (or DVR). Yes, I am that cheap. Everyone is shocked when I tell them we don't have one. ...to cut off more than 8" on your hair because you want it to be healthy again. I love my long hair but after all the bleaching and colouring I did to it over the summer, it had to go. ...to find it adorable that Mila Kunis and Ashton Kutcher are now a couple after being former co-stars on That 70's Show. I believe in if it's meant to be, it's meant to be (just like Blake and Ryan - so happy that they got married). ...to boycott Starbucks because they decided to remove the free syrup and soy milk from their rewards program. I only registered a card because of this perk. My favorite drink is a toffee nut lactose-free Americano Misto. Without the free syrup and milk, it would cost me $2.55 but now it will cost me $3.65. The free perks saved me $1.10 with each drink and I rather take the free syrup and milk over a free drink after every 12 I purchase. Does this change affect your favorite Starbucks drink? I was contacted by Medical Assistant Certification and they sent me the image below to review. I think it's great reference tool for those curious and interested in a cleanse. I am thinking about doing a cleanse again. I have tried a cleanse where you cut out certain foods in your diet (David Kirsch). This one worked wonders for me but because I eliminated red meat from my diet for over two months, I got really sick, like violently ill the next time I tried to eat a steak. Since then, I have tried to lay off red meats. David's nutrition guide helped me begin to eat healthy after following his plan for two weeks. With his guidance and frequent exercise, I got myself down 10 lbs - this was almost three years ago. I have also tried a whole body cleanse. I basically had to take a bunch of pills daily to flush out all the toxins in my body. It will instantly make you lose two pounds. I don't do this to lose weight, I do it at least once a year because I want to get rid of all the nastiness lingering in my body. So, I am not sure what kind of cleanse I will do starting at the end of the month but if you are thinking of doing one yourself, take a look below for some general information about different types of cleanses. It all started out when a fellow blogger, Joanne, tweeted that her friend's little sister was selling macaron charms. I tweeted her back saying that I would buy a charm if she made a donut. And guess what? Tiff jumped at the challenge and made me a donut with pink icing and sprinkles. I then told her that if she could make a donut with chocolate glaze, I would also purchase it. I placed the order and Tiff was really quick in mailing it to me. I am so pleased with what I got. Her prices are so much less than what I saw on Etsy for donut charms. I would definitely consider ordering from her again, especially after she told me she will be making more food charms! Her store, Tiffy's Boutique is up on Storenvy. I'm not quite sure but I may have been her first customer. If you are looking for charms, please consider contacting Tiff and maybe, if you are lucky, she might be able to make something for you that is not in her store. Of course, the straps did not come with the charms. When I was in San Jose last month, I was shopping at Daiso and came across this pack of straps. I was second guessing myself when I got to the register, thinking, "what the heck am I going to do with these things and when would I ever use them". Something just possessed me to buy it because you never know when I might need them. Well, it's come in pretty handy with these charms and the little Domo I bought for Mike. Now I am thinking that I should have bought more. Big apology for the quality of my photos. I take them with my iPhone (yup, I still have a 3Gs and hoping to get the 5), because I'm too lazy to use a real camera. I've tried to reach you by email or twitter to get your mailing info. I'll be sending the wallet out to you tomorrow. Thanks for entering! I'm glad to be joining in on Random Thursday this week, I missed last week due to a busy work day. 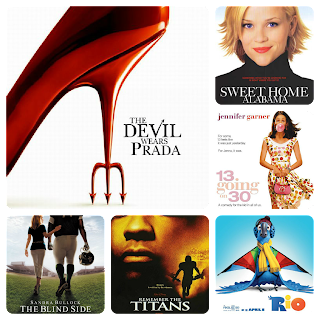 This week is all about my Favorite Feel Good Movies. It's hard to narrow it down but I have chosen the ones that I can watch over and over again because somehow they just make me feel better when I am sick, sad or restless. I own all these movies but if it's on the tube, of course, I will watch it..commercials and all. Sweet Home Alabama (2002) | Patrick Dempsey, yes please! Before he was McDreamy on Grey's Anatomy, he was dreamy in this movie. This movie has that feel good ending. 13 Going on 30 (2004) | This movie also has such a great ending. Does this movie make me feel all bubble instead because of the dance number to Thriller...I think so! I'm not a huge fan of Jennifer Garner but she is so lovable in this movie. This is one of those movies that just always happens to be on TV. Remember the Titans (2000) | I love football movies and for some reason, all football movies (like Varsity Blues and the next movie) and television shows (Friday Night Lights) always make me wish that I grew up in the States. Friday nights on the field, the bloodshed and tears of game, the sportsmanship and the relationships...what's not to love? Remember the Titans is based on a true story and all true stories leave you with a fuzzy warm heart. The Blind Side (2009) | Sad, true but oh so good. This is a perfect family movie to watch on a Sunday. If this movie doesn't make you feel good after watching then maybe you don't have a soul. Sandra Bullock is amazing in this movie. Rio (2011) | The soundtrack alone with have you dancing and wishing you were in Brazil. I really wish that I went to watch this movie on the big screen but a copy in Blu-ray will do. Best Disney movie ever! What is your Favorite Feel Good Movie? Just a couple of things I am either impressed with or obsessing over these days. Is there anything you are obsessing over that you want to share with me? Donut charms. I have been looking all over Etsy for a donut charm, something like the above photo and then a blogger friend tweeted that her friend's sister opened up a storenvy shop to sell macaron charms. I dared and asked if she could make a donut charm, and within hours, she made two custom charms for me. I placed the order yesterday and I can wait to receive them. Jiro Dreams of Sushi. If you are a sushi fanatic, you must watch this documentary. Jiro Ono is 85 years old, has worked his whole life making sushi never taking a vacation and is a perfectionist. Talk about dedication, inspiration and a love for their craft. Even if it costs $300+ to eat at his sushi restaurant, I still want to try it. A wait list of over half a year, only 10 seats in the restaurant...you know this sushi will be to die for! After watching Jiro Dreams of Sushi, I will never eat at an all-you-can-eat sushi place. Rich Kids on Instagram. This will make you mad. Seeing all these rich kids flaunt their parent's money. I have to admit though, it's kinda fun to look at. Hipster Toddlers. Cuteness galore! 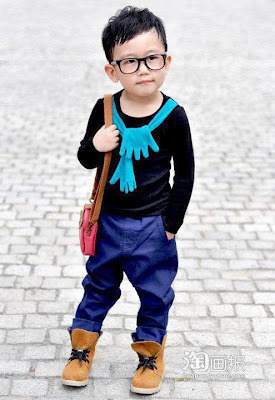 Kids can be so darn cute, especially when their parents dress them like hipsters. I know of two kids who definitely need to be on here - Brayden S. and Fern H.
Oia Jules. I know I've talked about this Etsy shop before but because there is a promo code for 15% off until Sept 3, I had to buy another bracelet and necklace. I am completely obsessed and I think my sister-in-law has become obsessed too! You have one day to take advantage of this promo - STRIPES15. Don't miss out! 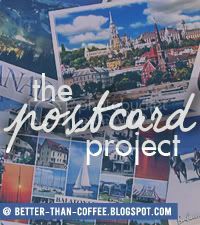 And before I forget, you have a couple of days, well, maybe two days (since pairings get sent out on Wed) to sign up for the Postcard Project over on Better Than Coffee. For more details, check it out here.